Every spring, summer and fall I stuff my pantry with lots of home made jams, marmalades and preserves. 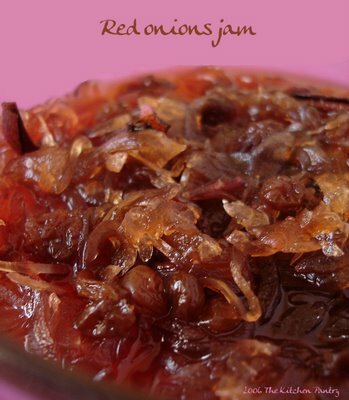 Red onions jam is one of my favourite: of course is a savoury jam, not a sweet one you spread on bread first thing in the morning! You can taste it with meat, alone on bread, or as chutney. Red onions are better than blonde ones not just for the colour, but also for their milder taste. You can season it with any herb you like. This recipe is from an Italian cuisine magazine, Il meglio di Sale&Pepe, Conserve dolci e salate, 2006. Peel the onions and finely slice them. Put them in a large pan along with sugar, bay leaves, raisins, cinnamon, cloves and little salt. Let it stand for an hour, so all the flavours will combine and the sugar will liquidize. Add vinegar and wine bring to the boiling point and cook gently for 1 hour, until you get a thick jam. Once is cooked, store in sterilized jars, close them, turn upside down and let it coll. Store in your pantry. It keeps for 8 months.